My last trip to Vegas was fun, especially when I was stocking up at the local booze shop on some wine. You see, where I come from we can’t get a large selection of wines and the ones we can get are priced close to two times as high as in other states. 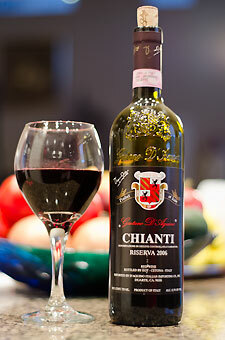 So in a frenzy of grabbing about 15 bottles on the way out of town I grabbed the Gaetano D’Aquino Chianti. This is a very inexpensive (okay, cheap) wine, but what a great value. I found the win to have a good bold taste with nice tannins, a finish that lasts a while. I’m no wine snob and I’ll be the first to admit it. I simply know what I like and what I don’t. The 2006 Gaetano D’Aquino Chianti is a keeper.